Yup, I have given up my vegan experiment. It was just too difficult when I am out of the house 5 long days a week. Plus I am working very hard at the moment so when I am home I do not have the energy after such a long day to prepare something to take in the next day. I was definitely losing weight, despite the nuts I nibbled. Did I feel better? I can not honestly say. Mainly because the vegan diet coincided with a busy time at work and too much going on at home. I can confirm I did NOT feel worse. One possible benefit was that I do sometimes suffer from very itchy shins and that went away so possibly that was diet related. Dieting is hard enough and restricting what I eat at the same time was just too much. So I enjoyed a shepherd’s pie on Sunday and cheese on toast. I had promised myself I could have a toasted cheese sandwich when I finished my vegan challenge. I had one yesterday from EAT with ham in it too and it was heavenly. I was in a different office yesterday, near Liverpool Street Station and I really enjoyed the walk back to London Bridge at the end of the day. 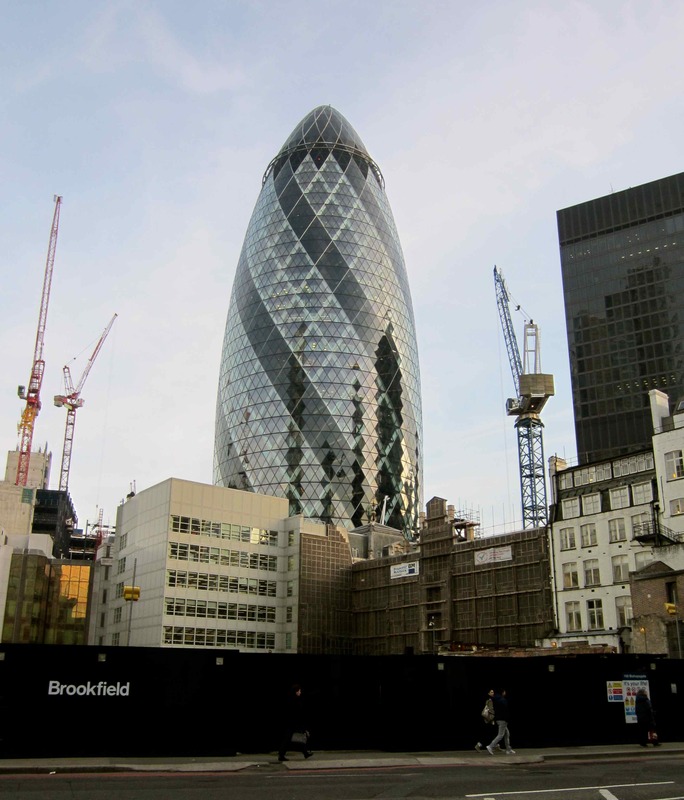 There is so much building work going on at the moment in London. 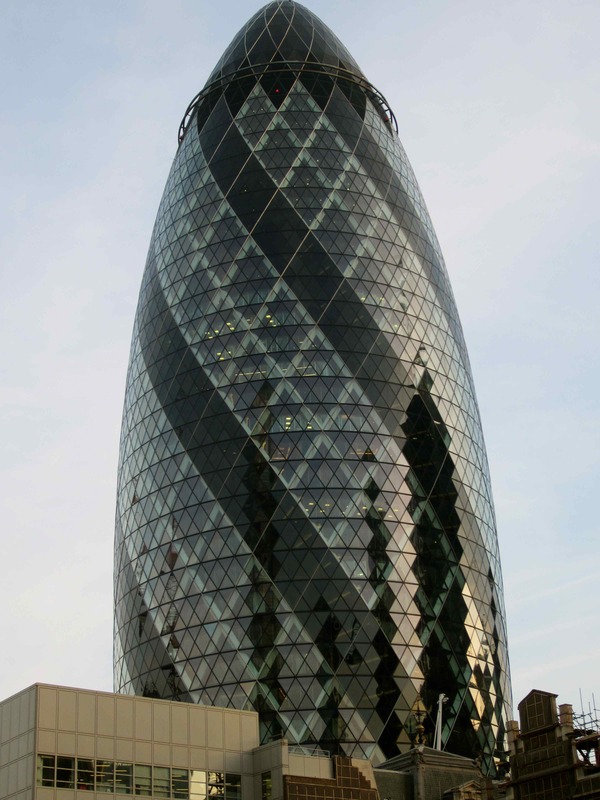 This is ‘The Gherkin’ – I had not realised how shiny it was until seeing it at this angle with no buildings obscuring the view. 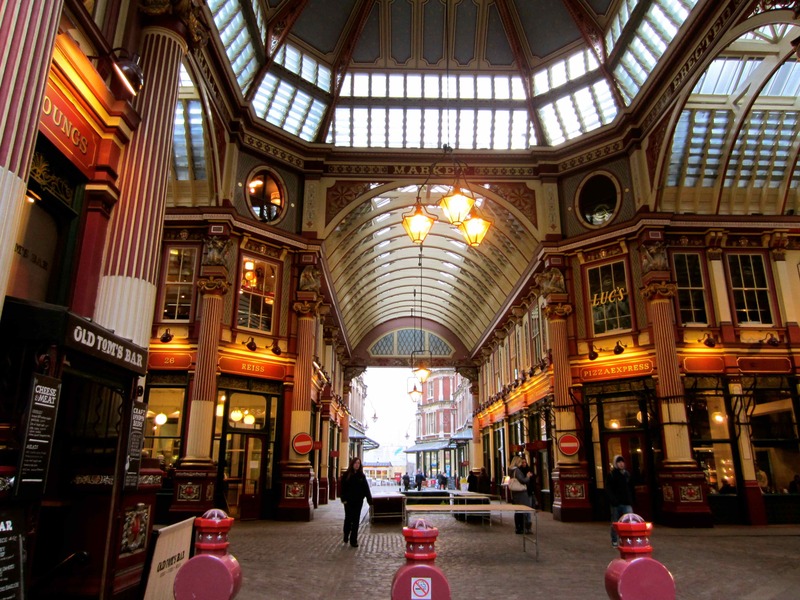 I was enjoying being outside so I took a little detour to walk through Leadenhall Market. 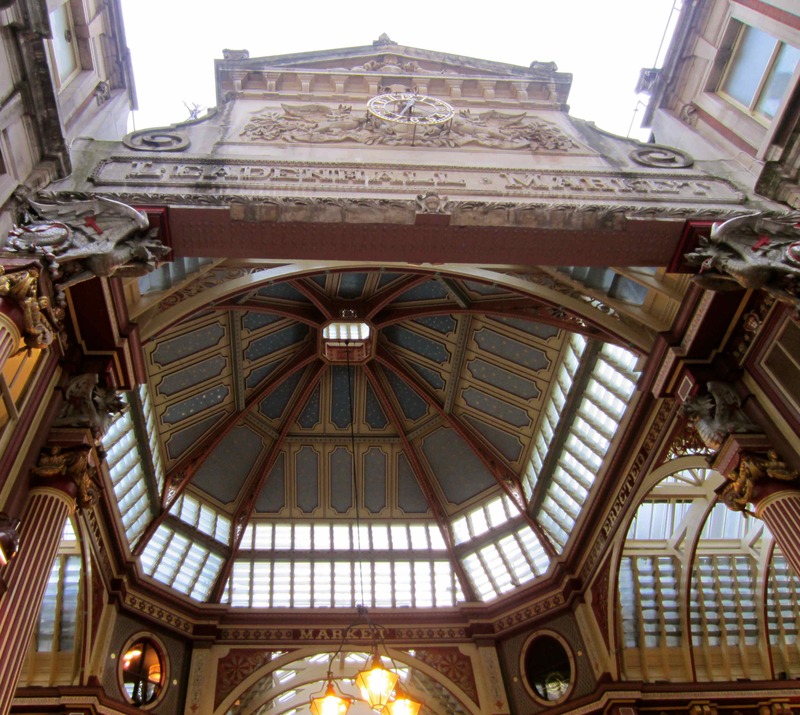 Unfortunately the shops in here are a little uninspiring but the buildings are beautiful. When I worked near here, many years ago, there was a Cranks wholefood shop which was excellent for lunches and a music shop, Farringdon’s, which sold some unusual CDS and was good for browsing in at lunch time. I did enjoy a browse through a book shop which has been here for a long time. This angle is looking at the Lamb Tavern and you can see part of Lloyds of London, the insurance market at the end. It is the silver building with all the pipes! I have eaten far too much bread and biscuits and even chocolate this week. I went a bit crazy after opening up the range of foods I am allowed again. This is such a struggle but one I must persevere with. 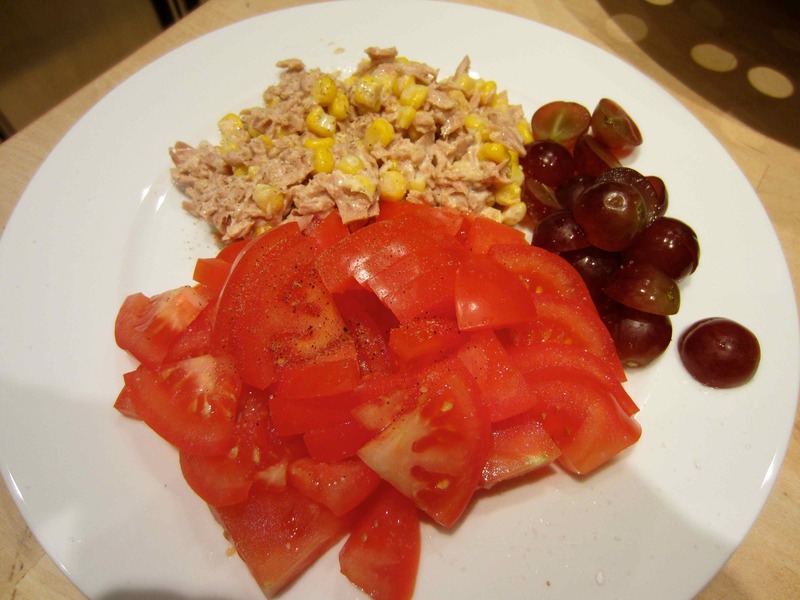 Tuna and sweetcorn for supper with 2 large juicy tomatoes and some grapes. That may be the first fruit and vegetables I have eaten since Sunday. yes, the diet has been that bad! I really admire people who stick to a restricted diet but it is not for me. I will however try to add more vegan foods to our diet and cut down on cheese and butter. This entry was posted in Diet Struggles. Bookmark the permalink. Congrats …you did a good job. I have always found that I need to find a way to eat that I can do for the long run….. Other wise it never works for me…..You are doing a great job. 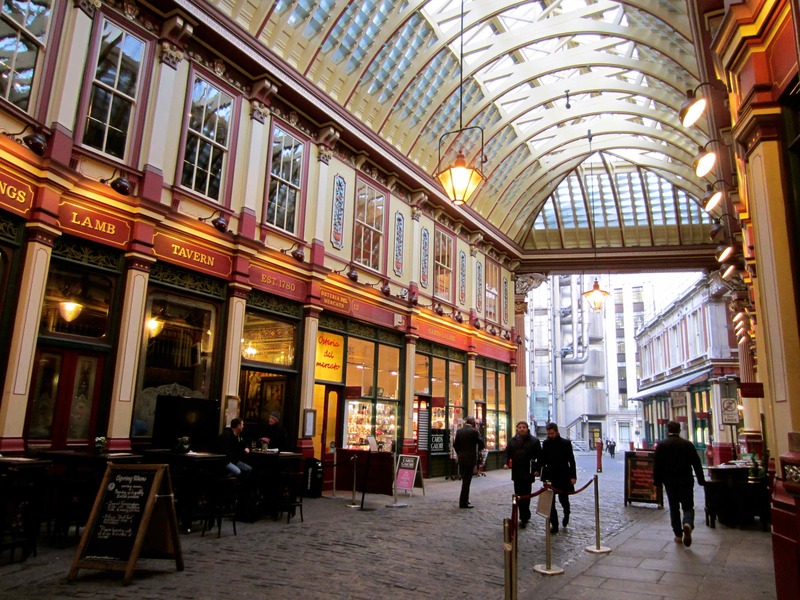 Enjoying the photos of London again…hope to see it one day. Zoe no way of eating is going to work if you are under pressure to eat that certain way. Definitely take note of what you ate when your shins start itching again because I can guarantee you that we are what we eat, inside and out. You did well and pat yourself on the back for going longer than ½ a month eating vegan. Now you can do Meatless Mondays or something like that to continue putting foods into you that have not been hormone or antibiotic induced. Or one meal a day that is totally vegan. I just wanted to try it for a month to wean myself off cheese and butter. I am pleased I tried it and I will definitely be observing what I ate when my shins itch again. I get this sometimes as well, especially in the last 5 years and it always seems so random and always on the spider vein on my shin. Maybe there is a connection of the spider vein and the itch?? It has been awhile, knock on wood. It sure does sound like a food allergy. I hope it isn’t the dairy. I hope it isn’t dairy but it does seem that we crave foods we are allergic to and my legs have really annoyed me today. Slightly inflammed and very itchy. I am going to really cut down on dairy and see if it improves. The only way you will be able to address it is by elimination, one thing at a time for a few days. Good luck.